In this lecture we look at the progress that has been made in studying jets with the aid of large-scale simulations. 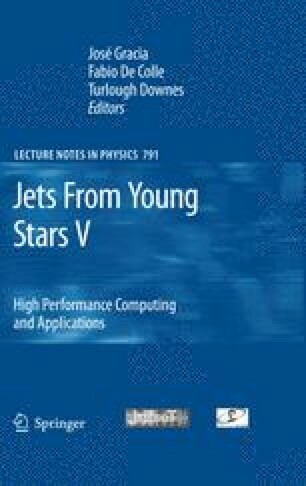 With modern computational resources and techniques it is now possible to simulate jets with reasonable resolution to a realistic age. This opens the possibility of finding out what effects a stellar jet has on its surroundings, as well as studying the stability of these jets even taking account of sophisticated chemistry occurring in the flows. This work was partly funded by the CosmoGrid project, funded under the Programme for Research in Third Level Institutions (PRTLI) administered by the Irish Higher Education Authority under the National Development Plan and with partial support from the European Regional Development Fund. The present work was also supported in part by the European Community’s Marie Curie Actions – Human Resource and Mobility within the JETSET (Jet Simulations, Experiments and Theory) network under contract MRTN-CT-2004 005592.